Acute disseminated encephalomyelitis (ADEM) is an immune-mediated inflammatory disorder of the central nervous system. The white matter of the brain and spinal cord is predominantly affected although cortical gray matter, thalami, and basal ganglia are often involved. Antecedent infection is commonly reported and prodromal symptoms include fever, malaise, and headaches. This is followed by the development of a rapid onset encephalopathy accompanied by multifocal neurological deficits, which characterizes the typical clinical course. Diagnosis rests on the combination of suggestive clinical and radiological features as there is no specific biomarker for the condition. Prolonged fever in the absence of neurological abnormalities is an unusual presentation of ADEM. 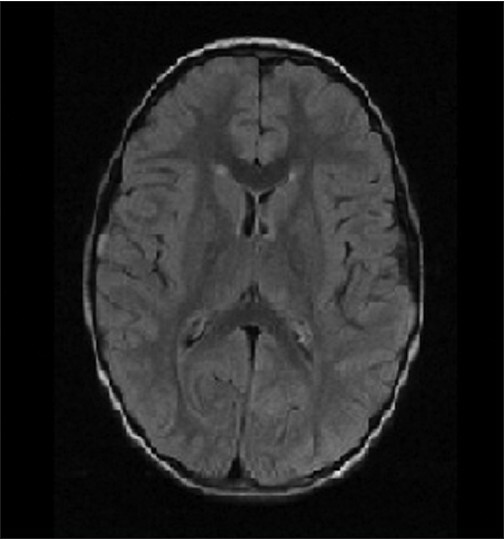 We describe a case of a previously healthy 6-year-old girl who presented with a 4 week history of pyrexia of unknown origin without any focal neurological signs. She was subsequently found to have radiological and immunological features consistent with ADEM. A 6-year-old girl was admitted with a history of intermittent fever up to 39.8°C for 4 weeks. During this period she had been assessed in the emergency unit on three occasions and discharged. At these visits she was variously diagnosed with an upper respiratory tract infection which required no treatment and a urinary tract infection for which antibiotics were prescribed. Despite the resolution of respiratory and urinary symptoms, she remained febrile. On admission parents reported that she was more sleepy than usual. She was conscious and alert. Cranial nerve examination was normal and she did not have any neurological deficit. Past medical history was unremarkable and there was nothing of note in her family history. There had been no recent foreign travel or vaccinations. Investigations included baseline biochemistry, liver function, bone biochemistry, C-reactive protein (CRP), autoantibody screen, blood cultures on three occasions, viral serology, echocardiogram, and chest radiography. These were within normal limits or negative. Cerebrospinal fluid (CSF) analysis showed cell count was normal, culture and Polymerase Chain Reaction (PCR) for bacteria and viruses negative. CSF protein was elevated. Oligoclonal bands were positive and showed evidence of intrathecal IgG synthesis. Baseline Electroencephalogram (EEG) showed generalized slowing of background activity. Neuroimaging performed 6 weeks into the febrile illness was abnormal [Figure 1]. T2 and Fluid attenuated inversion recovery (FLAIR) sequences showed hyperintense lesions in the lentiform nucleus and both thalami. There was high signal seen bilaterally in the caudate nucleus, cerebellar peduncles, and cerebellar cortex. She had radiological features suggestive of ADEM spectrum. She was treated with intravenous methylprednisolone 30 mg/kg/day for 5 days. Her fever improved within 2 days and complete recovery was achieved after 2 weeks. On follow up at 3 months, she remained well and there were no parental concerns. There was near complete resolution of the abnormalities on repeat MRI [Figure 2]. The criterion for pyrexia of unknown origin was suggested by Petersdorf and Beeson in 1961. This included fever higher than 38.3°C (101°F) on several occasions, persisting without diagnosis for at least 3 weeks and at least 1 week's investigation in hospital. A newer and broader definition has also been suggested, which includes three outpatient visits or 3 days in the hospital without elucidation of a cause or 1 week of 'intelligent and invasive' ambulatory investigation. This patient fulfilled all the criteria required to be evaluated for pyrexia of unknown origin (PUO). The diagnosis was suggested by neuroimaging findings and later CSF intrathecal synthesis of oligoclonal bands was noted. Although, presence of intrathecally synthesized oligoclonal bands is not specific to ADEM, it can support the diagnosis. In a series of 21 patients with ADEM, 29% had evidence of intrathecal synthesis of oligoclonal bands. In our case, treatment with high dose steroids resulted in clinical improvement with resolution of radiological abnormalities on follow-up scan. Other important differential diagnosis for increased T2 signals in MRI includes multiple sclerosis, cerebral angitis and posterior reversible encephalomyelitis syndrome (PRES) which were considered and investigated. Literature search did not reveal a similar case. Dale et al. reported two cases presenting with PUO and neurological signs in their series. Our case is unique as PUO was not accompanied by focal neurological signs. 1. Tenembaum S, Chitnis T, Ness J, Hahn JS, International Pediatric MS Study Group. Acute disseminated encephalomyelitis. Neurology 2007;68(16 Suppl2):S23-36. 2. Miller HG, Stanton JB, Gibbons JL. Parainfectious encephalomyelitis and related syndromes, A critical review of the neurological complications of certain specific fevers. Q J Med 1956;25:427-505. 3. Johnson RT. The pathogenesis of acute viral encephalitis and postinfectious encephalomyelitis. J Infect Dis 1987;155:359-64. 4. Icagsioglu FD, Atalar M, Ayvaz A, Kaya A. Acute demyelinating encephalomyelitis presenting with a mass lesion. J Pediatr Neurol 2011;9:101-4. 5. Hamaguchi K. Guillain-Barre syndrome and cacute disseminated encephalomyelitis (ADEM). Rinsho Shinkeigaku 1996;36:1301-7. 6. Krishnakumar P, Jayakrishnan MP, Beegum MN, Riyaz A. Acute disseminated encephalomyelitis presenting as acute psychotic disorder. Indian Pediatr 2008;45:999-1001. 7. Petersdorf RG, Beeson PB. Fever of unexplained origin: Report on 100 cases. Medicine (Baltimore) 1961;40:1-30. 8. Durack DT, Street AC. Fever of unknown origin-Re-examined and redefined. Curr Clin Top Infect Dis 1991;11:35-51. 9. Dale RC, de Sousa C, Chong WK, Cox TC, Harding B, Neville BG. Acute disseminated encephalomyelitis, multiphasic disseminated encephalomyelitis and multiple sclerosis in children. Brain 2000;123:2407-22. 10. Pasternak JF, De Vivo DC, Prensky AL. Steroid-responsive encephalomyelitis in childhood. Neurology 1980;30:481-6.